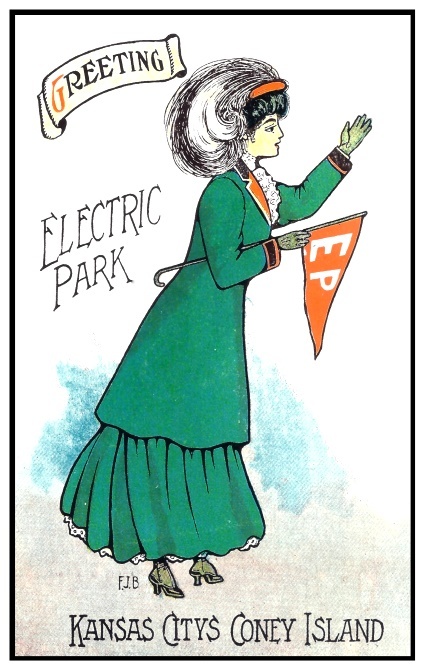 Electric Park was a name shared by dozens of amusement parks in the United States that were constructed as trolley parks. The emergence of trolley parks in the last dozen years of the 19th century coincided with the rise to promineence of three entities: the electric companies, the railway companies and the replacement of horse-drawn cars by electric trolley companies. A fourth contributor to the rise in amusement parks in the first decade of the 20th century was the success of Coney Island, which spurred the establishment of dozens of Electric Parks, Luna Parks, and White City amusement parks (the latter actually inspired by White City in the 1893 World's Columbian Exhibition in Chicago), with many metropolitan areas having two (or more) parks with these names. The existence of most of these parks was fairly brief: most of them closed by 1917, the year of the U.S. entry into World War I. Most Electric Parks were owned by electric companies and trolley companies, which often had one or more lines that transported workers and shoppers between the downtown areas of the various cities and residential and industrial areas. After 1890, interurban electric rail lines began carrying commuters from one city to another. Originally, the trolleys and interurban lines would operate at a reduced level on weekends or be completely idle. To generate weekend traffic, the companies eventually created new destinations, generally at the end of their lines, for the public to attend on the weekends, whether it be a picnic park or an amusement park. Regardless of the type of park, the destinations owned by the local electric company or accessed by the electric trolley were commonly called ”electric parks.” After it was built in 1903, Luna Park's success at Coney Island with the park's entrance decked with electric lights, inspired the creation of Electric Parks, which spread throughout North America. The similarly-inspired Frederick Ingersoll started to construct his Luna Park empire. 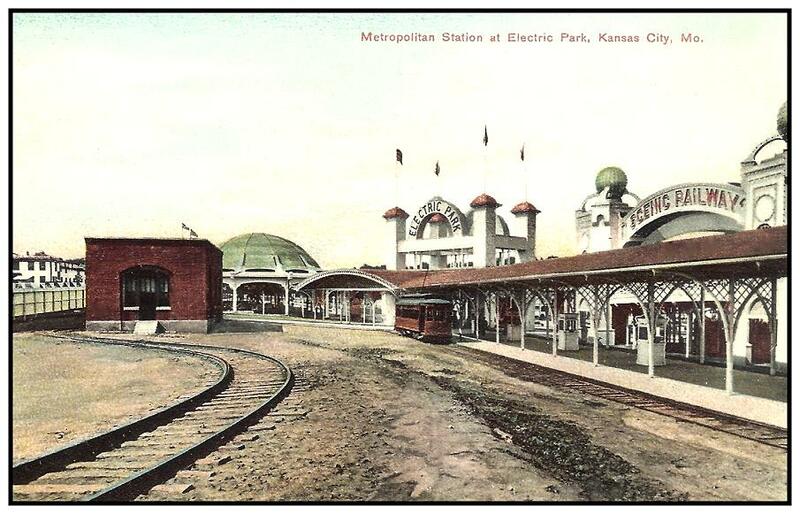 The Metropolitan Street Railway Station at Electric Park in Kansas City, Missouri. 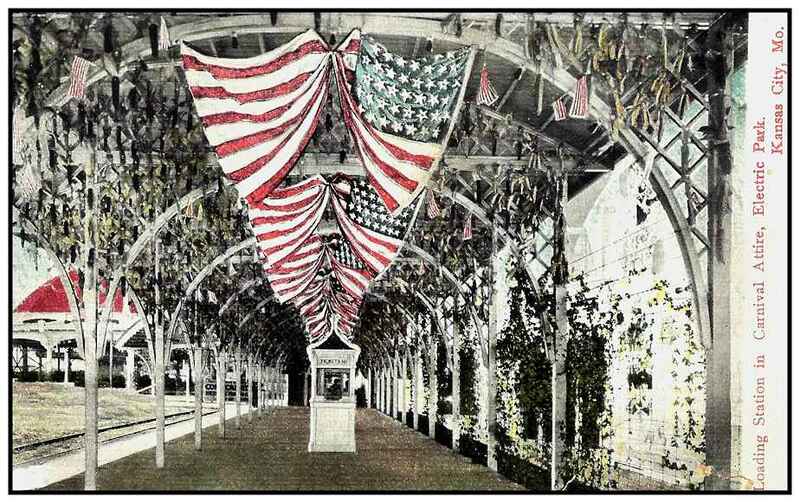 The Metropolitan Street Railway Station in carnival attire at Electric Park in 1909. Like their Luna Park and White City cousins, a typical Electric Park featured a shoot-the-chutes and lagoon, a roller coaster (usually a figure eight or a mountain railway), a midway, a Ferris wheel, games, and a pavilion. Most also had miniature railroads. Many cities had two (or all three) of the Electric Park/Luna Park/White City triumvirate in their vicinity... with each trying to outdo the others with new attractions, with many incorporating an exhibit simulating the Johnstown Flood of 1889. The competition was fierce, often driving the electric parks out of business with increasing costs of equipment upgrades, upkeep, and insurance. More than a few succumbed to fire. As a result, most were out of business by 1917, the year the United States entered World War I. By the time troops returned to the U.S. in 1919, almost all the Electric Parks were gone. 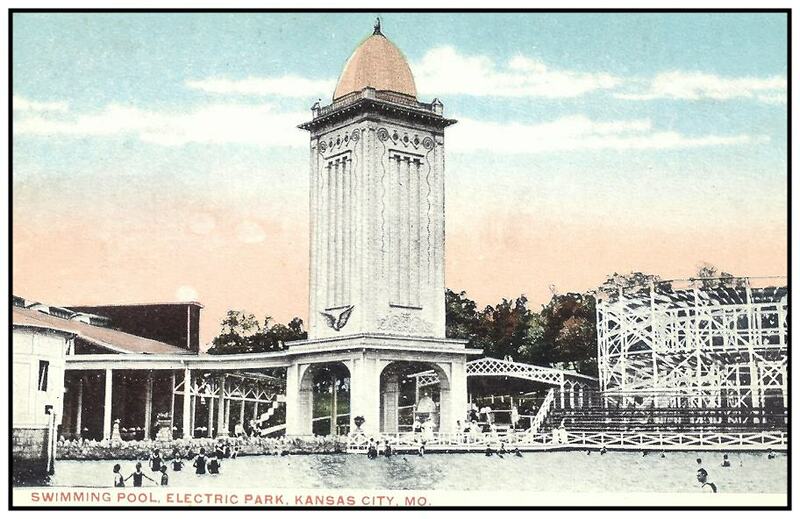 Electric Park was the name shared by two amusement parks in Kansas City, Missouri, that were constructed by Joseph Heim (then president of the Heim Brothers Brewery) and his brothers Michael and Ferdinand Jr. and run by them. The first was built next to the Heim Beer brewery in 1899; the second, a larger one, was built and opened for the public in 1907 and remained in operation until the end of the 1925 season. The Heim brothers built the first Electric Park in land adjacent to the Heim Brothers Brewery (at the time the largest brewery in the world) in East Bottoms. The amusement park was bounded by Montgall, Chestnut, Nicholson, and Rochester Avenues. 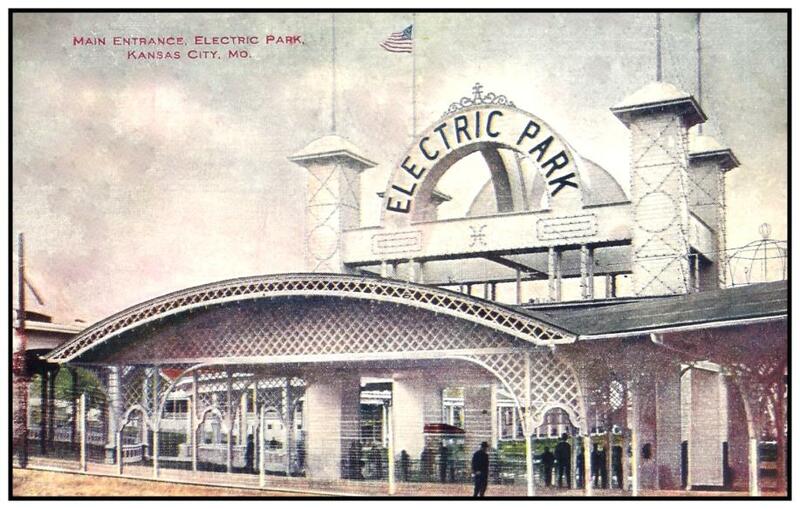 Open from 1899 to 1906, the first Electric Park proved to be an immediate success as one of the world's first full-time amusement parks. Featuring a Shoot-the-Chutes ride (called the Mystic Chute), the park also had a beer garden with beer piped directly from the brewery next door. Eventually, the carefully groomed grounds were too small to sustain the park's popularity; at the end of the 1906 season, some of the rides were dismantled and moved to a new location to the south. Much of the grounds lay neglected or abandoned for the next 19 years. In 1925, part of the plot (near the corner of Montgall and Rochester) was deeded to city of Kansas City for use as a neighborhood playground. Opened in an August 1, 1925 ceremony, the park offered "Pet Night," in which children won prizes for displaying the largest, smallest and the most deformed dog. Another day saw swimsuits awarded to boys who created wood carvings from dead trees. Main entrance to Electic Park in Kansas City. 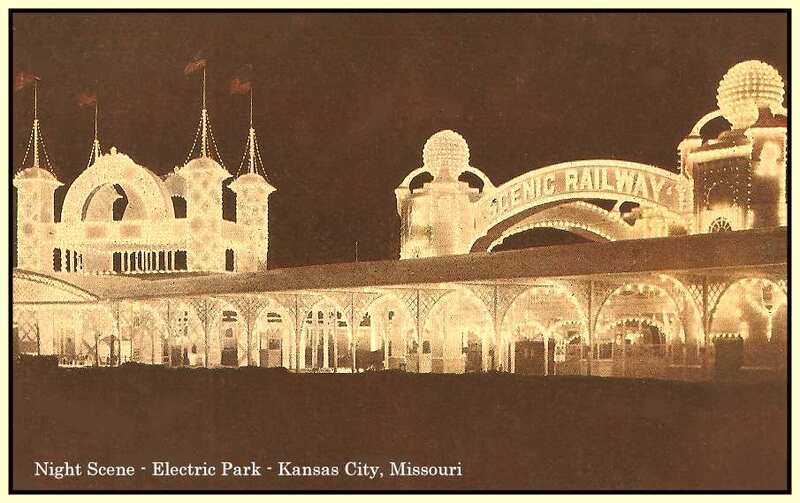 The second Kansas City Electric Park, this time at 46th Street and the Paseo, opened May 19. 1907. Like the first one, it was a trolley park (this time served by the Troost Avenue, Woodland Avenue, and Rockhill lines of the Metropolitan Street Railway Company), but the successor was one of the largest (if not the largest) ever to be called Electric Park. 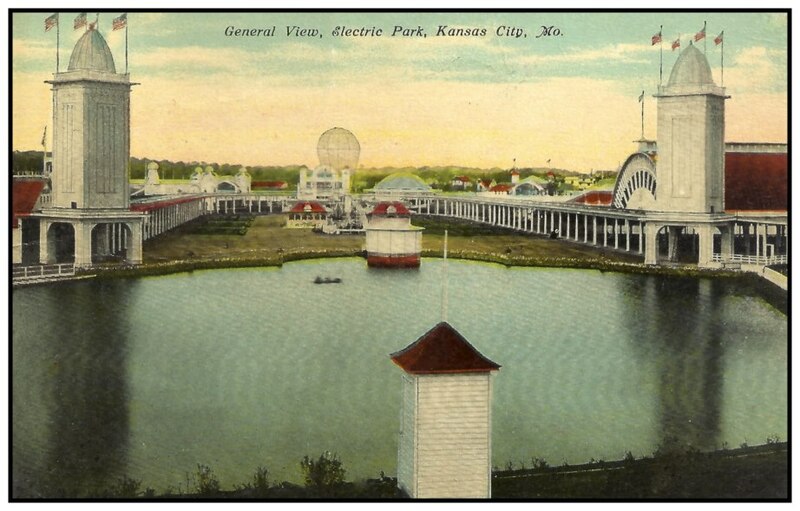 Electric Park had band concerts, vaudeville shows, a ballroom, a natatorium, an Electric Fountain, a German village, an alligator farm, water chutes, The Dips, a roller coaster, a Norton slide, penny parlors, a novelty stand, a Japanese rolling ball, a scenic railway, a pool room, a Hale's Tour of the World, an Electric Studio, boat tours, an old mill, a Temple of Mirth, a Flying Lady, a Double Whirl, a Circle Swing, a soda fountain and ice cream shops, a knife rack, a doll rack, a shooting gallery, an air gun gallery, a giant teeter, boating, outdoor swimming, a carousel, clubhouse café, Casino 5-cent theater, fortune telling and palmistry, a covered promenade and horseless buggy garage. Souvenirs from the park touted it as "Kansas City's Coney Island, which it matched by having 100,000 light bulbs adorn its buildings. In 1911, the second Kansas City park attracted one million people, averaging 8,000 paying customers per day that season. Entrance to Electic Park at night. The swimming pool at Electic Park. Despite the devastating blaze, the park maintained its operating hours as its theater and its aquarium remained open for the remainder of its last year. In the final days of 1925, Electric Park inaugurated its Coin Carnival to replace its destroyed midway. The two weeks before its final closing, Electric Park celebrated its own Mardi Gras after the Heim family decided to sell the land. On September 1, 1925 a fireworks exhibition punctuated the park's last closing ceremony. After Elias Charles Disney moved his family to Kansas City in 1911, a nine-year-old Walt and his younger sister Ruth became regular visitors to the second Electric Park, which was a mere 15 blocks from their new home at 3028 Bellefontaine Street. 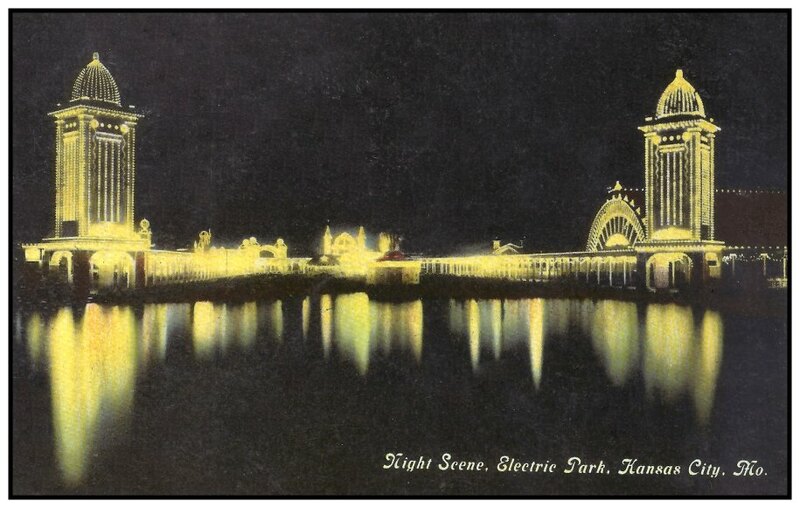 While the Kansas City park was inspired by the original White City in the 1893 Columbian Exposition (for which Elias was a construction worker), Walt later incorporated many features of the Kansas City Electric Park, including a train whose track ringed the park grounds and the daily fireworks show at closing time, when he started developing the plans for the layout of Disneyland, which he opened in 1955. Unlike many of its contemporaries, the Electric Park's grounds were meticulously maintained with landscaping designed to accentuate the park's rides and other attractions, a trait that Disney insisted to be maintained in Disneyland. Electric Park's "Living Statuary" electric procession featured young women emerging from a fountain onto a platform while bathed in various colored lights. Disney's entrances featured structures similar in design and structure to that of Electric Park's Monkey Cage Gazebo. In fact, most of the attractions that graced Disney's childhood park had similar counterparts in the California park that he opened three decades later.